Unfortunately, the issue of women preachers is only a superficial symptom of a much deeper problem. To fully address the root cause of this controversy, please allow me a moment of introduction. The satanic wolf has once again dawned the cloak of sheepskin and invaded the ranks of Christendom. In an effort to dilute the Creator's system, he has launched a campaign to demonize law. Sadly, he has convinced the masses that grace and law are enemies. His devilish approach involves three steps. First, he targets those who have been bruised and battered by legalism. Their weariness and legitimate disdain for the self-righteous pursuits of modern-day Pharisees leaves them desperate for another approach. Instead of responding with balance, they often fall into the ditch on the opposite side of the road. Satan wins! Second, he exploits the desperation which clouds their judgement. He convinces them that God's dismissal of the Old Testament Law is equivalent to God dismissing all other laws as well. Even the new law is dismissed as not really a law at all. (James 1:25, 2:12) In order to support their "grace will cover it" approach, they take many references to the Old Testament Law out of context. They build a law against law and, in the process, they become guilty of their own brand of legalism. Satan wins! Thirdly, he entices them into defining grace as a gift that is so "free" it cannot even be accepted (a perverted view of predestination). Without free will, personal responsibility is also challenged. Compromise becomes tantalizing and the justification of casual obedience becomes the result. (Consider three examples listed below.) Satan wins! Compromisers say, "Baptism for the remission of sins isn't really necessary," even though its necessity is clearly taught in Acts 2:38. Satan's PR campaign takes over. We compromise, legitimize, then justify baptism for whatever reason man decides is acceptable. Compromisers say, "Homosexuality isn't really as bad as some prudish Christians say it is," even though its perversion is clearly condemned in Romans 1:18-32. Satan's PR campaign takes over. We compromise, legitimize, then justify the desecration of the temple of the Holy Spirit. Compromisers say, "Limited roles of women in the church are really just out-dated, cultural regulations that no longer apply," even though God has had those teachings in place since the Garden of Eden and He was sure to re-emphasize them when He established the church, Ephesians 5:22-33. Satan's PR campaign takes over. We compromise, legitimize, then justify women preachers, etc…. ...the foundational issue at play here really is not "Should women be preachers?" The real issue is the demonization of law. …which brings us to the topic of this article. The reason for the lengthy introduction is this, the foundational issue at play here really is not "Should women be preachers?" The real issue is the demonization of law. Throughout the ages, the Creator has been very careful to give consistent instruction on His design for man/woman relationships. Throughout time, cultural trends have challenged His design and history records that all of those cultures suffered chaos and eventual destruction because they demonized law. Law is not the enemy! Even the Old Law was good for the purpose God gave it. To assume that grace precludes our responsibility to obey a law is to miss God's nature. God is love and when His nature becomes the law, love becomes the reason we submit. But please hear me! The law of love leads to far more than just obedience. The law of love leads Christians to submit to the Master in both action and in purpose. Return to the examples above. The law of love leads lovers to do more than just obey, it leads them to be baptized for the purpose God designed (i.e. for the remission of sins, Acts 2:38). The law of love leads lovers to do more than just resist homosexual temptation, it leads them to promote marriage between a man and woman because that honors the Creator's purpose. The law of love leads lovers to do more than just submit to gender-specific roles within the church, it leads them to thrive within their role and it leads them to challenge all those who would demean God's standards by reducing them to a battle of the sexes. The law of love puts God's intentions above our own. It places His directives above our needs, even the need to understand why. 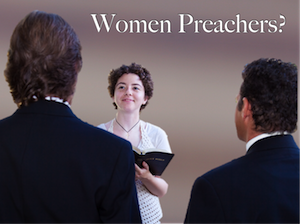 Should women be preachers? Maturity demands that we apply more than just simple obedience to a legal code. 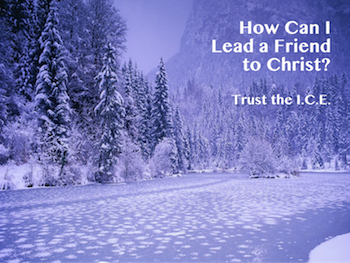 Mature Christians also seek God's intent behind the law. Ever since Jesus gave the mission statement in Matthew 28:18-20, it has been the prime directive of the church to bring Good News clarity into a world of self-destructive chaos. I believe the feminist agenda infiltrating our ranks with a gender-neutral interpretation of Scripture is among the most damaging efforts Satan has at work today. It promotes confusion, not Good News clarity. Gender-specific roles in the home, the church, and even the community are much more than just cultural trends. Truth is truth regardless of the time and the place in which it is being applied. (See "What Is Truth?") Applications may change, but the intent of the Divine instruction is eternal. The proper application of gender-specific roles is essential to the definition of Christ's love for and leadership within the church. "Wives, submit to your own husbands, as to the Lord. For the husband is head of the wife, as also Christ is head of the church; and He is the Savior of the body. Therefore, just as the church is subject to Christ, so let the wives be to their own husbands in everything." (Ephesians 5:22-24, NKJV) When the law of love is diminished, the intent behind the law is obscured by human selfishness. By design, gender-specific roles give definition to Christ's love for His bride, the church. If for no other reason than that, God's law should be honored. The proper application of gender-specific roles is essential to the order and the image of God in the heavenly realm. "For this reason the woman ought to have a symbol of authority on her head, because of the angels." (1 Corinthians 11:10, NKJV) When the law of love is diminished, the intent behind the law is obscured by human selfishness. If for no other reason than to protect the image of the One Who created us, gender-specific roles should be honored in the church. From the very beginning (Genesis 2:18), God intended for men and women to be complementary, not interchangeable. His interworking design was intended to illuminate our journey toward knowing Him. It was intended to be a living illustration of the relationship He desires to have with us. Submission to our role is essential to a relationship with Him. Gender-specific roles illuminate the Gospel. They define the path toward knowing God. In our self-destructing culture of lawlessness, the demonization of law must be opposed. Obedience to the law of love must be promoted. Do more than obey. Submit to God's nature. Give Him the intent of His heart. Back to Top of "Women Preachers?"